Finished chemo … 1 Year Ago! I can’t believe it’s been a year since my last chemo cycle. November 27, 2013 will be forever etched in my brain along with my diagnosis date, surgery date and treatment end date. I read my post from this day last year … wasn’t as bad as I expected. Maybe I was just so happy that it was my last one and chemo was over! I wish I knew then that a year later I’d be OK. I guess I really wasn’t thinking that far ahead since I still had surgery and radiation to go through. And let’s not forget the fact that I still had the chemo nasty side effects coming. The day of treatment was never really that bad. I’d usually feel really sleepy and physically fatigued but it gets worse the next day and then continues. I do actually remember my last cycle and what happened after. It was horrible, horrible, horrible! Pain in my bones, complete exhaustion, blisters in my mouth, burning tongue … TAXOTERE is a nasty drug. I was injected with toxic chemicals for 18 weeks! It feels surreal at times but I got through it and I’m still here! I wish I knew that I’d still be here. I wish I knew that I’d feel better emotionally. I wish I knew that I’d be happy and enjoying my life even though I’d still be recovering. It’s funny how at that time all I was trying to do was get through the day and then get through the next day. Well I got through 365 days! It’s still one day at a time and I kind of like it better that way. Helps me live in the moment! I’m happier and I think on my way to being healthier than before. So we will see what I’ll be saying this time next year. I think after all the bad there’s lots of good to come! It’s been exactly 4 months since my last chemo session and 1 week since my last radiation treatment. Treatment is done!!! I made it through and am still intact and doing ok. I’m so thankful for everything and grateful to be alive. Each day truly is a gift. 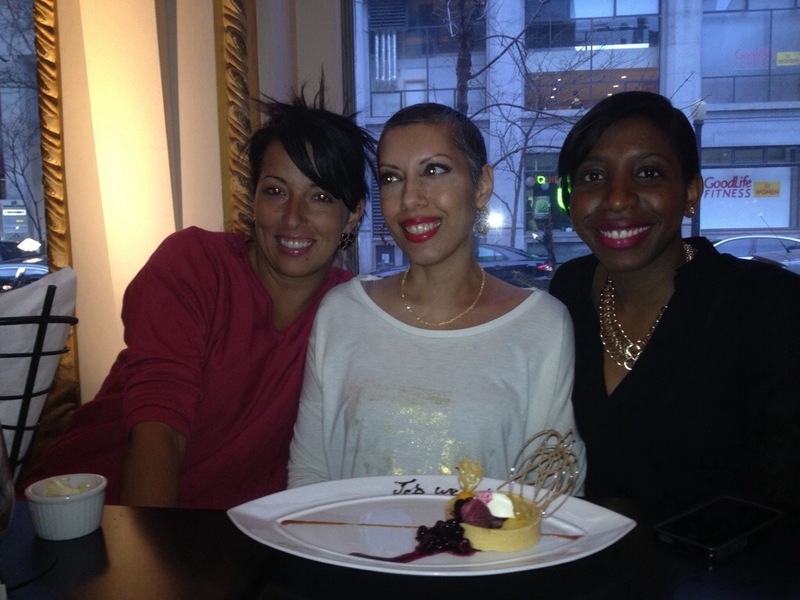 My hospital was downtown so after my last treatment on Thursday I met with some friends after work at Rosewater nearby. It’s a Thursday after work hot spot now and by 6pm was packed. Nice lounge menu, food was good. We got there early so had a nice sitting area by the windows on the main level. I had a wonderful time. Christiane brought me beautiful flowers and a card. I read one line and started tearing up so had to put the card away until I got home. Of course when I read it later there were tears rolling down my face. What she wrote was heartfelt and touching. Sean had them write ‘job well done’ on the dessert plate which was sweet. It felt good to be social again and I wasn’t exhausted by 9pm?! Maybe I was just so happy to be done with treatment that I was wired lol. My life was at risk and I was fighting the battle that know one wants to be in so the people that were there for me have a special place in my heart. At a time like that you need support, I can’t emphasize that enough. I don’t know how I would have made it through without my mother, my family, and my friends. Even the people who simply said something kind or showed me that they care. It’s something that was appreciated more than they know. For those on and off friends, sorry but I’ve turned that switch OFF. The next evening I went to a friends surprise birthday party. It was a family friend and he’s very sweet. His wife planned the party and I had a nice time. These are a different group of friends and all in the suburbs near my parents. Not all of them know what’s going on with me so I had my wig and eyelashes on. Again I didn’t feel exhausted and stayed pretty late! I always feel a little weird not telling people because then I have to pretend I’m working and still living in the city. Oh well, maybe it’s better to just be normal for a night. My mom had some family over on Sunday to have a celebration dinner which was nice. With CAKE! Yayyy! It’s been a really good week. My skin is not too bad. Depending on how much of my décolleté you can see you may notice that the left side is red/brown and darker than the rest of my skin. It’s also itchy and sensitive. The entire area from my neck to the bottom of my ribs looks like I’ve been in the sun too long. Hopefully will get better soon. I’m also emotional at times. I’ve been crying more this past week. I think it’s being overwhelmed with emotion realizing that my treatment is done and everything I just went through. Also being thankful to be alive after eight months of hell. The radiation was the easiest part for me. Now it’s time to focus on rehab and recovery.